This is a gallery dedicated to American Girl Fans and their dolls! You can be in it too! Look below for more details. Otherwise, keep exploring American Girl Doll Central.com! This is Sarah. She is 10 and a half years old and loves American Girl dolls! She has two: Molly and Sallyjoe, her JLY doll. Sarah is a Christian girl and loves taking her dolls anywhere that’s “dolly safe”. Here is a picture of Leanna’s dolls! From left to right: Ana, a blonde JLY doll, Lanie, GOTY 2010, and Kristy, a brunette JLY. Leanna and her dolls like to make photostories. Leanna likes to do her doll’s hair and dress them up and just playing with them! The doll on the left in the purple dress belongs to Amanda, a 12 year old who loves dolls. The doll pictured is named Faith Anne Seymour. Amanda also has two other dolls who aren’t pictured-a JLY doll named Hannah Marie, and a Mia Bella doll named Zoey. Amanda and her dolls love to read together, go shopping “play” school, have prayer time, and save money for hopefully another doll! This is Mackenzie, those most people call her Mack. Mackenzie is 13 years old and has three American Girl dolls, Julie, Addy, and Samantha (not pictured). “I LOVE AG!! !” says Mackenzie. She and her dolls like picking outfits to wear, watching movies, having tea parties, and going everywhere together….AND shopping! Mackenzie is a Christian and a BIG fan of AGDC! Ally loves American Girl dolls! (I took off the picture, it’s a very old one! Maybe I can get a new one IDK.) Her doll family includes Mia, Nicki, Molly, and her Just Like You doll named Sammi, whom she is pictured with here. Ally and her friends like to do Fashion Shows with the dolls. Ally’s little sister has the Emily and Kit American Girl Dolls, and also the blonde Bitty Twins. Joelle is 10 years old and has a Kit doll named Sarah. Joelle is one of our biggest fans at American Girl Doll Central. She has two siblings. 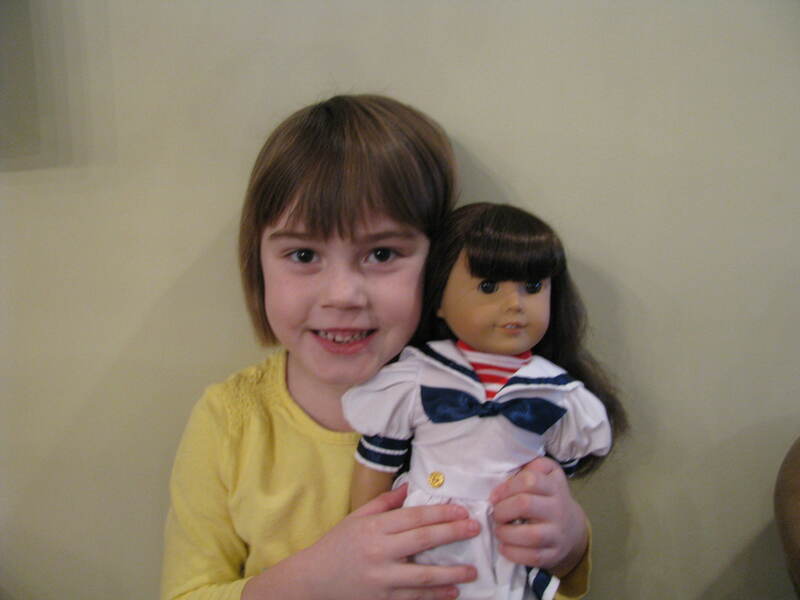 Abbey is 6 years old and has two American Girl dolls, a Just-Like-You doll named “Julia”, named after the historical doll Julie, and a Samantha doll, known as “Hannah”, whom she is pictured with here. She might get Kirsten soon from her grandparents. Abbey and her dolls like to visit Madeline’s house, and visit her dolls. Abbey also likes to visit her friend Olivia’s house. Sophie is 9 years old and has 7 American Girl Dolls. There names are, Kaya, Josefina, Julie, Simpora (Just Like You Doll), Chrissa, Ruthie and Samantha. She also has another doll which is sort-of-like -AG-doll named Anna.She loves to have sleepovers with her friends. She has lots of fun with them! Meghan is 14 years old and has two American Girl Dolls, Mia and Kit (Kit Maria). Here is a picture of her and Mia. She mostly likes to collect her dolls, and is working on creating a doll clothes company. You can check it out on the left at: TOO CUTE! DOLL CLOTHES. Hey Madeline i finally have my blog/website up. Hey if you could talk about it on here that would be GREAT WONDERFUL and SUPER… ha ha…. Hi I can’t seem to get on. It only comes up as an e-mail when I click on it. But I will add it when it is ready. Hey, and please send me a picture of Maria KIt or Mia in an outfit you made. Thanks. this is kayla.i’m the girl that won your givaway.i will send you my picture soon. Yes I know. Thank you! hey, kayla, do you know a girl named stephanie aka sam? just wondering. Cool!I will try to get my camrea working again so I can send you a picture. I think that its really creative what u r doing. Best of luck to u and club members!! Thank you, Maddie! I will deliver the message to FeeFee in just a minute! should i send a picture? I’d love for you too! You’ll have to visit her page to find out! OH! i forgot to say.. i have 2 sisters! i wanna be in it.whats ur email?bye!!! Yes you may! Please send the information above to my email. did u get my email of my pics yet?there r 2,1 of me on tha monkey bars and another pic of me beside them.bye maddie!!! Maddie, thanks SO MUCH for putting me on your friends and their dolls list! I SO appreciate it! hey, I forgot to say that I am an only child. Can you put that up, too? Please? maddie,can u write that im almost 11?or do u wanna wait till im 11 and then change it with my pic?bye!!! maddie u need 2 update mine. Maddie how do I get my picture on without email (I don’t have an email address) ? Hi it’s me after forever and a day!P.S now I’m almost 12 AND I gained a few new dolls.Lissie and 2 mystery dolls mabey soon to be 3 or 4 mystery dolls!You can use one of my pictures on my picasa if you want to.My e-mail is new,but please after you read this delete it incase some creep comes on here,OK?It’s sallyjoe99@gmail.com Bye!